Almost 30,000 incorrect world maps, with problems including rendering Taiwan as a country and wrong depiction of the Sino-Indian border, were destroyed by the customs authorities in Qingdao, East China's Shandong Province. 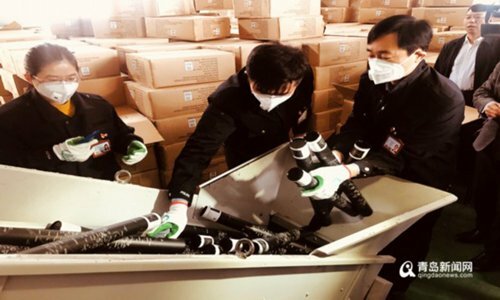 A total of 803 boxes of the 28,908 wrong maps were seized and destroyed, the largest amount to be disposed of in recent years, according to a news conference jointly held by the Ministry of Natural Resources, Shandong's Department of Natural Resources, Qingdao Customs and other related government agencies in Qingdao late last week, a Qingdao newspaper reported. The maps were produced by a company in East China's Anhui Province and were on the way to being exported to an unspecified foreign country. The crackdown was aimed at enhancing public awareness on national sovereignty and raising people's ability to distinguish such problematic maps, said the report. The problematic maps failed to show the correct territory of China and omitted South Tibet and the island of Taiwan, the Qingdao government found after an examination of the maps. Until now, related authorities have examined the domestic map market more than 100 times, and discovered over 10,000 incorrect maps, thus preventing them from being circulated inside the country and overseas. "What China did in the map market was absolutely legitimate and necessary, because sovereignty and territorial integrity are the most important things to a country. Both Taiwan and South Tibet are parts of China's territory which is sacred and inviolable based on the international law," said Liu Wenzong, professor from the department of International Law of China Foreign Affairs University. "If the wrong maps were circulated inside the country and abroad, it would have caused great harm to China's territorial integrity in the long run," noted Liu. "Fortunately, China's map management regulations require authorities to strengthen supervision and regulation of activities related to maps, providing a legal foundation to prevent damage to China's national interests." Since 2018, Qingdao has joined hands with other departments to establish an information sharing system for imported and exported maps, in order to quickly identify and take action against problematic maps. On December 14, 2015, the State Council issued a new set of regulations on maps, with the goal of tightening control over maps to safeguard state sovereignty. The regulations went into force on January 1, 2016.